With the recent launch of the 1NETv2, Thompson Aerospace has incorporated flight tracking and real-time performance data alerting and streaming. 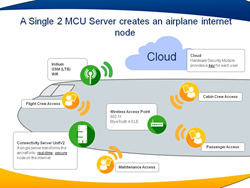 The 1NETv2, which continuously connects the aircraft to the cloud, collects all Category C and higher data and utilizes their patented hardware security to create the first secure Airborne Local Area Network. "we are still talking about how information technology could help our industry; the time to embrace technology is now, and the systems are available to any airline that wants to move forward." Thompson Aerospace of Irvine, CA announced today that they currently offer aircraft position tracking and performance alerting capability as part of their 1NET Airborne Local Area Network (ALAN). Thompson Aerospace is the leader in IT data management solutions for commercial aircraft.